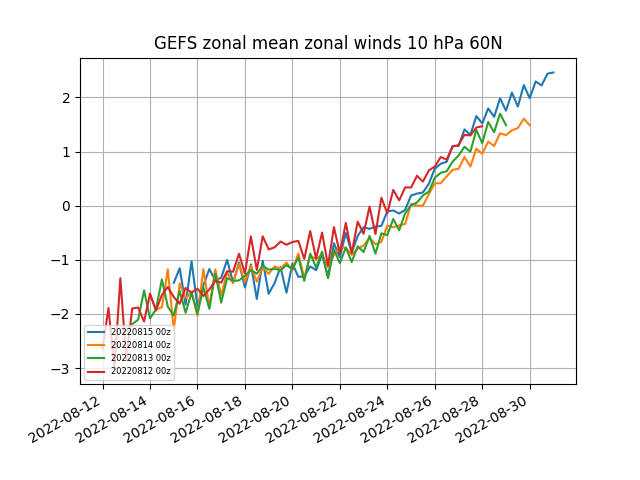 ELI5 - what does it mean when the zonal winds go down below 0? In short - It means that the normal direction the winds travel in at the stated height in the stratosphere essentially 'reverse' - the warming itself is normally caused by rossby wave events propogating up from the troposphere, these then reverse the polar strat jet (in the case of Major warmings) and then we see a reversal of our normal wind direction on the ground as the effect essentialy returns back down into the trop weather patterns, i.e everything flows from east to west rather than west to east- Greatly increasing the chances of colder weather arriving to Ireland. There are many levels of warmings and potential affects (i.e displaced or split vortex) - what we ideally want to give us the best shot at a cold pattern is a split vortex due to a major warming. A split isn't currently forcast yet but a major warming is- wave 2 is looking more and more likely to deliver the hammer blow in the coming weeks. 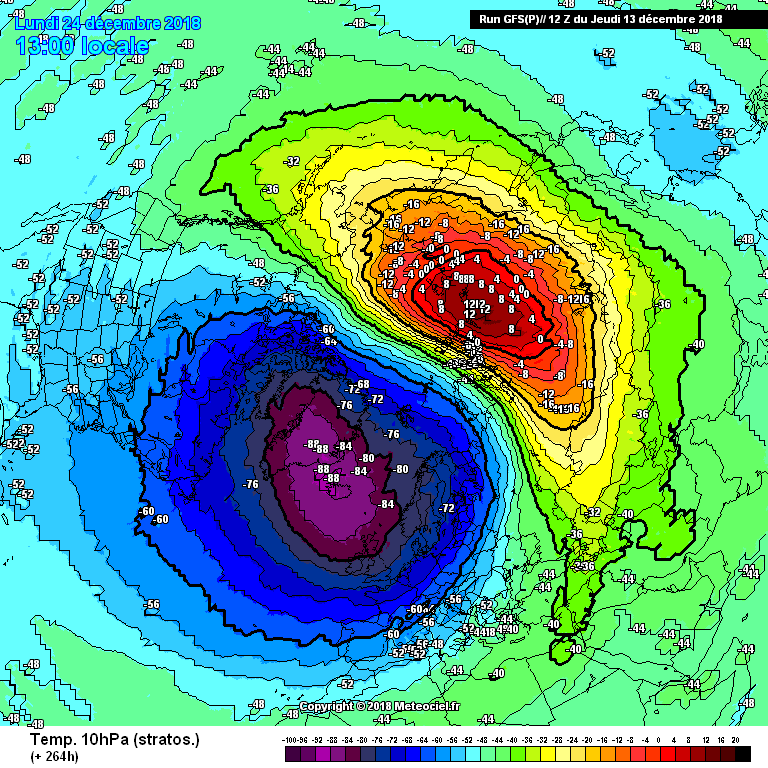 Roughly 2/3 Split vortex events lead to a cold pattern over NW europe. Its a lot more of a roll of the dice if we only manage a displaced vortex, it then entirely depends on where it displaces to. Major upgrade by the FV3 0z tonight, still showing the warming beginning on the 21st / 22nd and for the first time, staying in the red (and even sometimes the dark red!) throughout the entire rest of the run. As an aside, now that the beginnings of the warming have moved into the purview of the ECM, does anyone know of anywhere one can look at 10 hpa temperature charts from the ECM? Meteociel doesn't have them and every link I've found only shows current analysis of the start at that level, not a forecast out to 240h as with other ECM charts. Does this exist? University of Berlin. Simply search up University of Berlin ECM strat and you’ll find each of the forecast charts - also the wind/fluxes chart that I posted in a tweet here. Last edited by BLIZZARD7; 12-12-2018 at 18:27. Good agreement here still today, mean doesn't show quite as sharp a drop but thats normal variation, a few more extreme gefs members appearing also - as you were all things considered. GFS Para is really going for an extreme stratospheric warming, up to 12c in the stratosphere!! And it's "only" 11 days away ie. not stuck at the perpetual 16 days. In further response from the above tweet I posted which is of the UKMO Glosea5 showing this SSW event being similar to that of 2012-13 (which culminated in the coldest March since at least 1962), it goes onto show this stratospheric warming becoming a split at latter dates similar to 2012-13. Here's a GIF of reanalysed charts of how the 2012-13 warming evolved. Note at first it was a displacement before becoming a split and an obliteration of the Polar Vortex.